Three Israeli nationals removed from Turkish Airlines plane, interrogated after falsely claiming to be carrying explosives. 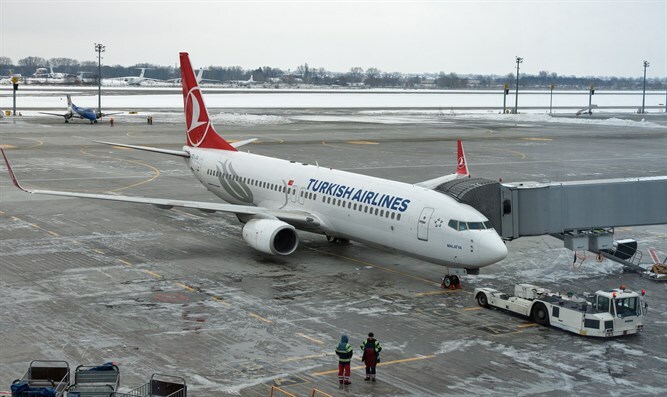 Three Israeli nationals were removed from a Turkish Airlines flight over the weekend and detained for questioning after they joked about carrying bombs with them onto the plane, Channel 10 reported Sunday night. The incident occurred in Istanbul, Turkey, after the three had already boarded the flight. The three Israelis reportedly joked about having explosive devices with them on the plane – a conversation meant in jest, but which was overheard by a Turkish Airlines stewardess. After she heard the three discussing the bombs they claimed they had brought on board, the stewardess alerted the captain of the plane, who immediately ordered the three Israeli passengers removed from the flight and handed over to airport authorities. Investigators in Istanbul questioned the three passengers, and after it became clear that they posed no threat, they were released. The three Israelis took a different flight the next day. Following their removal from the plane and transfer for interrogation, Turkish authorities contacted the Israeli consulate in Istanbul to notify the Israeli Foreign Ministry of the three Israeli passengers’ situation.